This post has business perspective focus: What factors are deteriorating local business environment (local in this post refers primarily to national environment, i.e. Finland) and causing problems, when a firm tries to drive its competitiveness. In addition, we shall discuss some ideas, how the negative trend can be reversed. Structural issues or general cost competitiveness are not addressed here. Local business environment, or "commons" as it is called, and how a company can utilise this environment, are essential building blocks of the company's competitiveness, also in global business context. Globalisation has created vast amount of new opportunities through international division of labour and expansion of reachable markets, and there is no need to cry over past, it´s gone. It is often argued that future winners, especially in software and content businesses, do not need to care about physical distances. Yes, it is true that access to target customers and smooth distribution of products to customers make is possible to expand business rapidly. But, as in other industries, also software and content businesses lean heavily on local environment - and actually their biggest new business opportunities are often linked to physical products. A company that has extensive global operations and networks, might not depend so much on local commons. But when studying this on single product or business level, it is clear that competitiveness can be considerably boosted by supportive local business environment. Thus a successful business carefully utilises its local operating environment, and also recognises that it is profitable to contribute to continuous development of commons. As noted above, local environment can either support or hinder development aims of a firm. 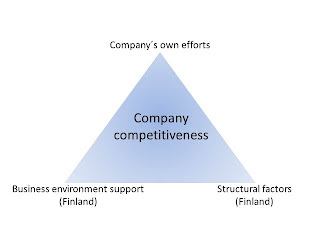 Omitting macro-economic factors, competitiveness of Finnish companies is also considerably affected by management decisions: Focusing on operational efficiency, resulting in delayed or insufficient renewal and innovation in response to new opportunities and challenges. Cutting costs by moving production to lower cost countries, of course, can help in the short term, but in the long run, it will not save the company. The sad story is that by outsourcing manufacturing, a company also significantly narrows many essential capabilities needed for renewal and innovation - especially, when creating high value-added products, manufacturing process often plays a key role. Once manufacturing is no longer physically close, process engineering expertise cannot be maintained, since it depends on daily interactions with manufacturing. Without process engineering capabilities, it is difficult to conduct research on new process technologies, which in turn makes developing new products more challenging. In Finland, one good example is dilution of electronic product related capabilities, caused by Nokia gradually moving manufacturing operations abroad. Similar kind of development is ongoing in other technology sectors, too - for example, related to STX cruise ship business. Outsourcing of manufacturing to other countries is particularly affecting expertise of subcontractors. If there are no muscles to follow the principals, e.g. sub-suppliers focusing on development of tools, materials and testing, have less motivation and assets to continue enhancing their products and skills further. When conducting mechanics, electronics and software R & D, continuous dialogue with component suppliers and manufacturing operations ensures low-cost bill of materials, low assembly and testing costs, good manufacturability and product quality. Often also purchase logistics, including sub-assemblies, is outsourced, which hampers high-quality R & D work. Manufacturing companies are also important customers for new products or processes - often it is possible to develop new products in collaboration with geographically close customers, jointly finding the solution features that really bring value to customers. Especially for startups and small businesses, physical distance may be an insurmountable obstacle to such an approach. Joint product and business model development with customers is one of the cornerstones of modern company's competitiveness. Although the Internet, social media and other advanced tools allow development with far-away consumers and enterprise customers, those customers that are located in close vicinity and otherwise qualify as good customers have their strong merits. In consumer markets, it is important that Finns continue to be willing and capable of testing and deploying new solutions. Good customer companies, on the other hand, are eagerly seeking vendor partners that can help them increase their own competitiveness: Hence, if a company renewal is forgotten, it has also a very negative impact on its supply chain companies. Both in B2C and B2B businesses, ability to build international customer relationships and distribution solutions is a prerequisite for a scalable, successful business - target market know-how, networks and experience are critical. If investors do not have understanding of a company business, it has significant consequences - for big listed companies, smaller ones and startups. In Finland, low number of listed consumer product and health care companies results in limited understanding of these businesses, lower levels of interest and high risk aversion. Startup investors prefer cases that relate to their own experience - in Finland e.g. mobile and gaming areas are overweight at the expense of other sectors. Let´s take a closer look at a Finnish consumer product startup to more deeply understand, how it was supported by the local operating environment. While the experiences can not be generalised to firms that are e.g. larger, operate in other industries or in B2B businesses, the case probably reveals many common experiences. Company product consists of dedicated devices with mechanic and electronic parts, device embedded software, smartphone or tablet application and cloud service software. The company had considerable expertise in various technologies, international business, sales and marketing, but it needed partners is such areas as development of mechanics and electronics, manufacturing, product commercialisation, distribution channels and business finance. Particularly difficult was to find a partner that is able to take overall responsibility for the mechanical and industrial design of a consumer product, and that has enough understanding of materials and mechanical components. It also looks that skills to develop consumer electronics hardware are not so strong outside of mobile device world: There is a lack of vision for the best future solutions, and thus component choices were problematic. Without company's own strong experience in project management, both development quality and schedules would have suffered badly. There were several suggestions that the entire device development (mechanics, electronics and embedded software) and manufacturing should be outsourced to experts (ODMs) in China and its neighbouring regions. On the basis of the evaluation, however, it was concluded that because product definition, product development and manufacturing need a concerted effort, it is best to outsource manufacturing to a Finnish or possibly Estonian partner, at least in the early stages. The challenge was that after Nokia gradually moved its manufacturing operations out of Finland, there are no companies left that are capable of assembling consumer products in volumes - the focus is primarily in industrial customers with small volume needs. Another example is steel molds needed for manufacturing plastic parts: After business changes of Perlos and Eimo, molds are not anymore manufactured in Finland and also very much of the related capabilities have been lost. The company got plenty of advice, how to commercialise the product, but it became clear that demand and brand building skills, painfully needed in international markets, were in short supply. Very often publicity tricks or tips of possible partners were the only substance, whereas, for example, it was difficult to get comprehensive business views, how to use the Internet and social media as a tool for commercialisation. Few people seemed to have experience in high-tech consumer product commercialisation, and if they had, it was strongly linked to mobile devices. In addition, understanding of international sales channels and distribution strategies beyond mobile operators and phones is thin. Larger retailers in Finland are also very careful in terms of new product concepts: They are waiting for tangible evidence of demand, rather success cases in the most important markets of the world, before they want to commit to new products, marketing and sales. Securing financing is one of the key startup challenges. 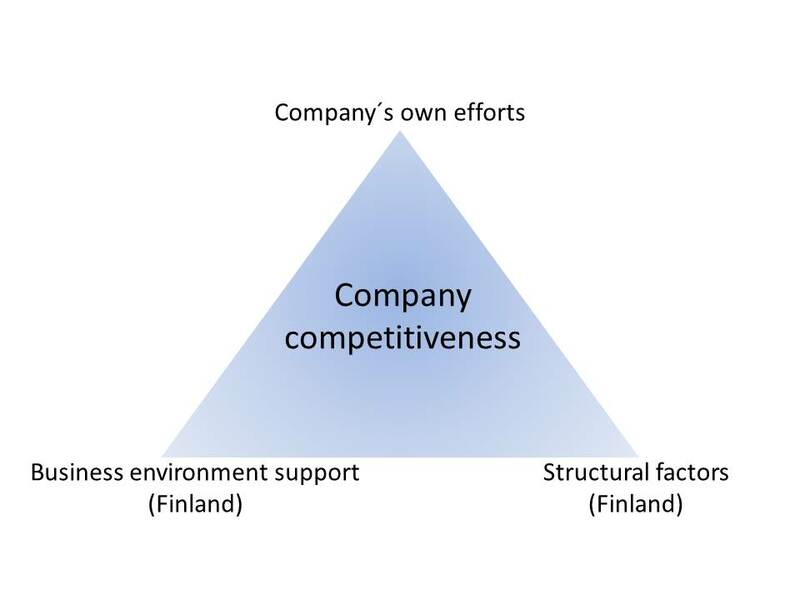 In Finland very few potential investors have optimal experience and knowledge background for the case company business: High-tech consumer products and their commercialisation as well as distribution channels to consumers. What can a company then do to best utilise local commons and contribute to further development of local business environment? Here are some ideas to start with. Companies need to create a customer-focused culture of continuous internal renewal and innovation. Understanding of customer needs, iterative product development based on customer feedback and a strong desire to find customers more value-adding solutions are the core of innovation and success. Not mere cost-cutting. Drive cooperation with other companies, especially in innovation and development. If you trust that your company is able to internally generate ideas needed for future success, tendering well-defined products and projects is a sensible model. But rarely all the wisdom is only within the company. The firm must open its innovation and development process in such a way that products, technologies, and expertise of external firms and other actors are actively screened. Promising ingredients are then combined with the company's own competences to create solutions and business models that even better meet the needs of customers. Experience and know-how to better use. There are plenty of experienced and knowledgeable professionals with seasoned business background that are under-utilised. First of all, they should be utilised much more widely, in particular for SMEs and startups, but also for business development of larger companies. Second, besides normal fee based consulting, there are plenty of other models, how experienced persons can be more deeply involved. Besides participating as an investor, e.g. performance-based assignments, interim management or part-time employment are feasible options. These experts are also often able to contribute their international networks and best practises, how to deal with them. Owners and investors should demand renewal and innovation. Future success correlates with ability to produce new value for customers. This applies both to listed and non-listed companies, and should be reflected in the guidance of its owners. Boosting public sector effectiveness requires renewal and innovation. Strictly limited invitations to tender are not the best means to get new ideas and to create opportunities for innovative companies to develop reference customers. Innovations in collaboration with corporate partners should be an integral part of the public sector toolbox. From company support to innovation support. Customer money is much more valuable than any direct support received. Could part of the Tekes funds be re-directed to support joint customer - vendor business innovation? Thus, for example, a client could get support for introduction of a new solution and would pay supplier as usually. And if the new and innovative solution achieves targeted business benefits, the customer would pay the support money back to Tekes.